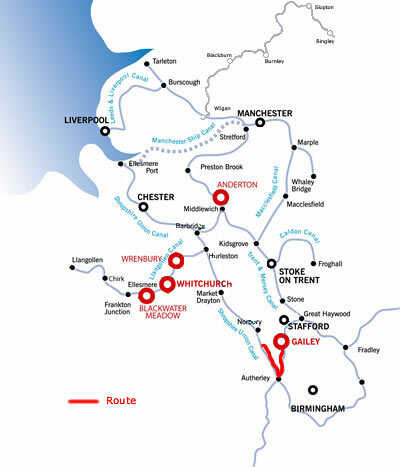 A rural route through the Staffordshire countryside, along the quiet stretches of the Shropshire Union Canal, past small villages and Canalside pubs. Only 2 locks each way so a very easy route to do! Chillington Hall, close to the village of Brewood (pronounced Brood), is home to the “Fancy Bridge” named by the workers who built the Shroppie. Powerful landowners demanded grand and ornamental bridges where the canal crossed their properties and this is a fine example of such work. A tree lined avenue crosses the canal here leading up to Chillington Hall which is now a venue for Weddings. Just a short distance upstream from Chillington Hall is Brewood and you will find shops, pubs and restaurants close at hand and there is also a boatyard all of which should meet any of your requirements. Just beyond Brewood you will see the Belvide Reservoir which supplies water for the canal. A very short distance from there is a cast iron aqueduct, the Stretton Aqueduct, which was built in 1832. It is used to cross the A5 Watling Street and take you onwards to Wheaton Aston where you will find the first lock on the Shroppie other than the stop lock at Autherley. The Wheaton Aston lock is unique by way of being the only singular lock on the canal route as the other locks are bunched together in "flights". This made for quicker working by the boat people because locks could be easily prepared in advance of the boats. 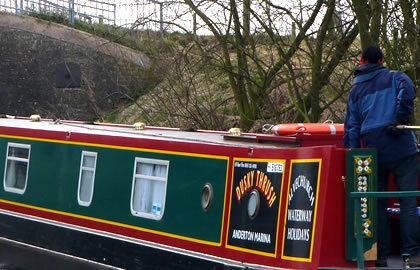 At Wheaton Aston you will find a waterside garage that offers some useful facilities for boaters and a canalside pub. Wheaton Aston also has a few basic supplies, and you need to moor up for the night here and turn your boat around ready for the journey home.